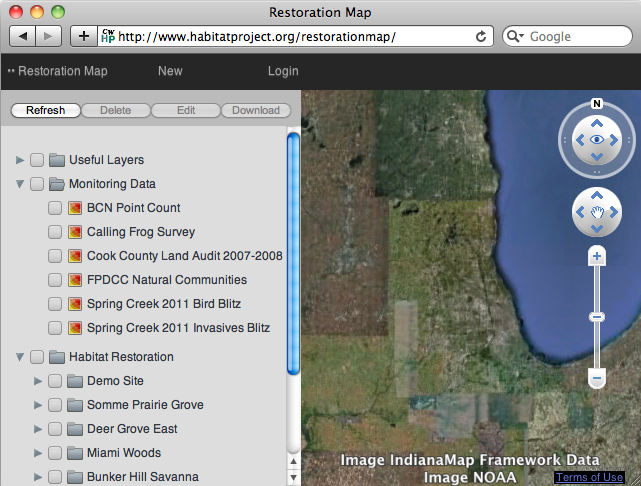 This page shows how to navigate the map, view stewardship sites and monitoring data, and make measurements on the map. 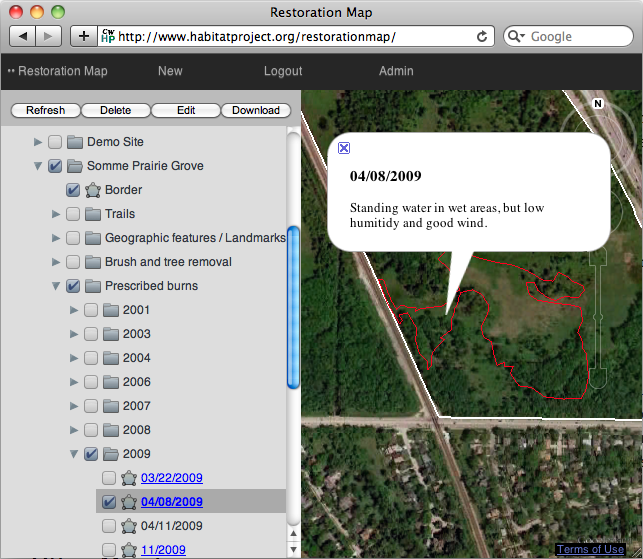 To view Restoration Map, you will first need to install the Google Earth Plugin. Then launch the map by clicking here. Once Restoration Map has loaded, you will see a globe in the main panel. The globe will zoom into the Chicago area. To the far right are the controls for navigating the globe. If you hover the mouse over each control an explanation will pop up. In the left panel is a navigation tree for turning map layers on and off. Double click on a stewardship site to zoom in to the site. Click on the arrow next to the site name to view the map layers within the site. Each site has layers organized by common restoration activities such as prescribed burns, brush removal, seeding, and weed control. These are each further organized by date. Double clicking on an individual layer will zoom into it. Clicking on the layer on the map will show a pop up window with further details about the layer. Monitoring the abundance and distribution of birds, frogs, plants, and other organisms provides useful information on the health of an ecosystem. Monitoring data throughout the Chicago area is collected by dedicated volunteers. 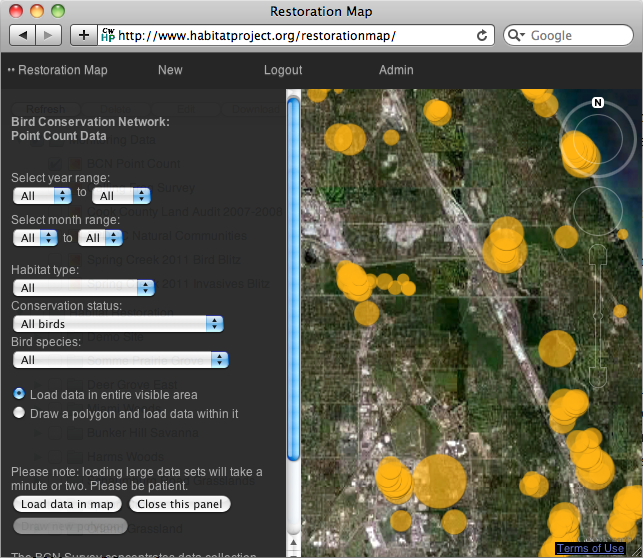 Some of that data can be viewed in Restoration Map as map layers. Click the box next to the name of the monitoring layer to activate the map layer and an info panel will appear with more details about the map layer. A number of helpful layers are available from Google Earth such as Roads, Historical Imagery, and Status Bar (which displays latitude and longitude). There is also a soil type layer provided direct from NRCS (unavailable in some locations like within Chicago city limits). Wetland data from US Fish and Wildlife is also available. 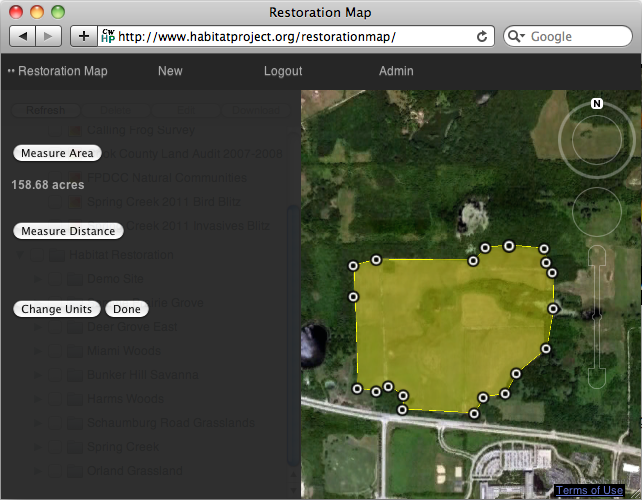 Under the Restoration Map pulldown menu (at the top of the browser window) click Measure. Then click either Measure Area or Measure Distance. Then click the points on the map which you would like to measure. You can toggle between metric and english units by clicking Change Units. When you are done measuring click Done. Sometimes if there is a network glitch the map has difficulty displaying layers on the map. Click the Refresh button to reload all map data from the database. © 2019 Restoration Map. Supported by Audubon Chicago Region.